Click through for selections of our published work. Travel on a budget? Ask the pros! When it comes to travel, we're pro. Thanks to Elizabeth Helen Spencer for tapping into our expertise and sharing! Check out her article on Money Under 30 for some tips from Kendon Photography and other travel hackers. Urban Land Institute award nomination for Innova! 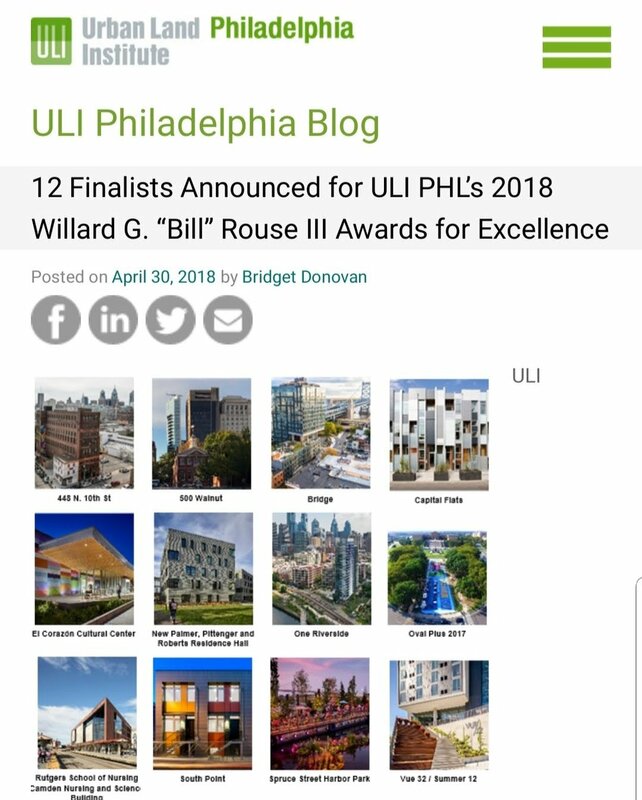 Congrats to Innova Redevelopment for their recent ULI award nomination. We're rooting for your win! From Innova's website: "In July of 2015, Innova broke ground on an affordable infill project in Point Breeze. Innova was selected to test the viability of the City's "Workforce Housing" initiative for building unsubsidized affordable housing on vacant City land. This project, located on four desolate blocks, was comprised of 15 high quality homes, built with Passive House detailing, designed for an ultra-low energy load and sold for an average of $239,000. By the end of 2016, Innova had developed and sold all 15 homes plus 4 adjacent parcels with market rate houses built to the same energy standards, transforming largely vacant blocks into now-vibrant communities." Read more about Innova and President Jeff Allegretti on the Urban Land Institute blog here. To commemorate the centennial of the Benjamin Franklin Parkway join AIA Philadelphia’s Women In Architecture and architectural photographer Kat Kendon to shutterbug down the Parkway. At the beginning of the tour Kat will give a brief overview of the art of architectural photography. She will share general principles and strategies for lighting, framing, and other tips on how to elevate your shots. The tour will make stops at iconic landmarks to photograph and appreciate their respective contributions to the civic realm. Let’s capture the Parkway’s beauty as it turns 100 years young! Photographers, hobbyist, photo enthusiasts, as well as SLRs and cell photo cameras are all welcomed. We will plan to end the walk at the Philadelphia Museum of Art. Big news - Kendon Photography and Philadelphia AIA's Women in Architecture Committee are teaming up with Jane's Walk to offer a walking tour in Philadelphia. Details coming soon, but this event will be open to shutterbugs, architects, history buffs, fans of Jane's work, and everyone else who wants to tag along! I'm proud to be a female photographer in a male-dominated industry, proud to join forces with Women in Architecture, and even prouder to honor Jane Jacobs. Hope to see you on our Jane's walk. She's a winner! VCU's James Cabell Library has been awarded the Excellence in Academic Libraries award by the Association of College and Research Libraries. Great job VCU and team! We are thrilled to announce a new partnership with Boston-based firms Build Health International and Adaptiv. Stay tuned for upcoming collaborations on their efforts in Haiti. 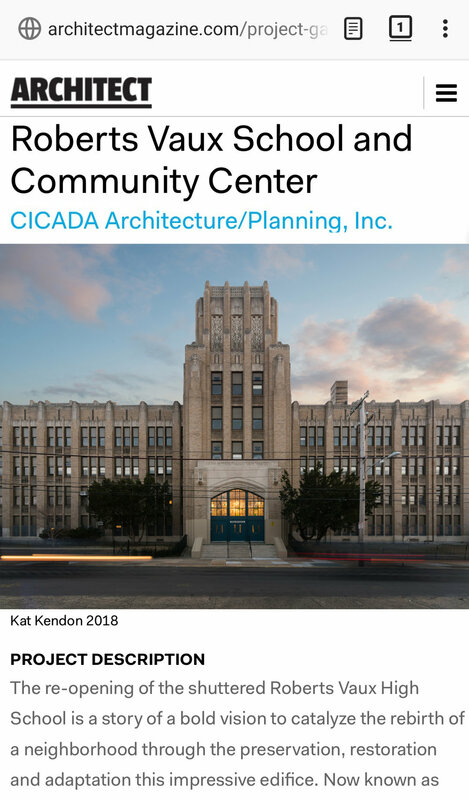 Congrats to the Cicada architecture team, who had their renovation to the shuttered Vaux Big Picture School featured in this month's issue of Architect Magazine. Check out the pictures and write up - great job team! We'll be at Temple University this week along with Ivan Guzman Photography to talk about the transition from college to freelance life, and the benefits of joining a professional organization like ASMP. Come say hi! We're also interviewing interns and assistants. Find us in Temple's Tyler School of Art Lobby from 10:30 on. See you there and come with questions for the experts! Photography Charrettes: Gear up for spring shooting! Did you know Kendon Photography offers portfolio review workshops? We'll review your firm's portfolio, identify what makes a photo match your brand, and talk about how to get more mileage out of your images. This workshop can be done with a small group of decision makers, or expand to involve the entire firm. We can also review your digital asset systems and recommend archiving software from the most basic to state of the art. Contact us for more information and to schedule your session! Wow! The lead-off image for L+G's website reboot is a Kendon Photography shot from 2017's Parking Day. Looking good guys! Image feature in the Inquirer: Does Philadelphia need a law mandating affordable housing? "San Francisco does it. New York does it. So does Washington. As their housing costs have skyrocketed, pricing out the working poor and making it difficult for even middle-income people to find affordable housing, those cities have adopted laws requiring new developments to include subsidized units for low-wage workers. The difference, of course, is that Philadelphia already has some of the cheapest housing stock of any big American city." Read more by Inga Saffron and check out Kendon Photography images here. Parking Day is nearly here! Parking day is September 15th, 2017! Will your firm be designing a parklet? Contact me if you'd like progress shots of your design featured. Excited to join the board of ASMP's Philadelphia Chapter! Oooh la la, looking good AIAP! Check out new murals in the Spring Arts District! I love a good mural shoot: that moment where arts and architecture come together. Check out what's been happening in the Spring Arts district with tours led by Conrad Benner of Streets Dept. It was a pleasure to document this one...colorful umbrellas make rainy days brighter! Always a treat to get to shoot artists at work - NDA is a master. Check out more of his work here. Figment Phila: Join us for a participatory arts fest in Clark Park! It's been a pleasure to be the producer of this year's FIGMENT arts festival (along with an amazing partner, Bevan Weismann of New American Public Art.) FIGMENT is a free, inclusive, participatory arts event held in cities worldwide. Come down to check out the projects this weekend in Clark Park. I'll be there with a walkie-talkie in one hand and a camera in the other, find me and say hi! Everyone is welcome! Thanks to Sense Us Philly for the photo and coverage of our project! They asked our production team, artists, and festival attendees how they choose to spend their hard-earned cash. Check out their blog for the responses. Wow, I'm incredibly honored to have been selected as one of 25 people making a difference by South Philly Review. I started my volunteer work by partnering with local nonprofits as a photographer, but this one grew into something much bigger. Fantastic day yesterday shooting in Mantua...can't wait to share more from this project! Happy New Year everyone! Some 2018 favorites - cover shots at Steven's University; gorgeous and thoughtful housing for those struggling with homelessness by Kitchen & Associates; stunning Fishtown renos with James Bill's team; portfolio reviews with ASMP; the lovely touch of Blackney Hayes at GSB; and the life-changing work of Adaptiv and Build Health International in Haiti. Looking forward to new projects in 2019! I'm just smitten with this #seaportboston gem, great job @hacinassociates team! The weather and leaves just don't get better than this for fall shooting! #onlocation for Stevens Institute, thanks @_bryonnamonet for the assist & 📸! "Within the walls of this lobby are the prayers and struggles of roughly 150,000 people. Inscribed on white strips of cloth and blessed by Pope Francis, these prayers were collected at the Knotted Grotto, a public art installation that had significant impact surrounding the Papal visit to Philadelphia in September 2015. The Knotted Grotto held space for the struggles of all, while focusing attention on those struggling with homelessness and hunger." @megsaligmanstudio put together something amazing here! Ruth Williams House provides 88 units of affordable housing to men and women who are homeless, formerly homeless or at risk of becoming homeless - thanks to Kitchen & Associates for bringing me on such an amazing project!